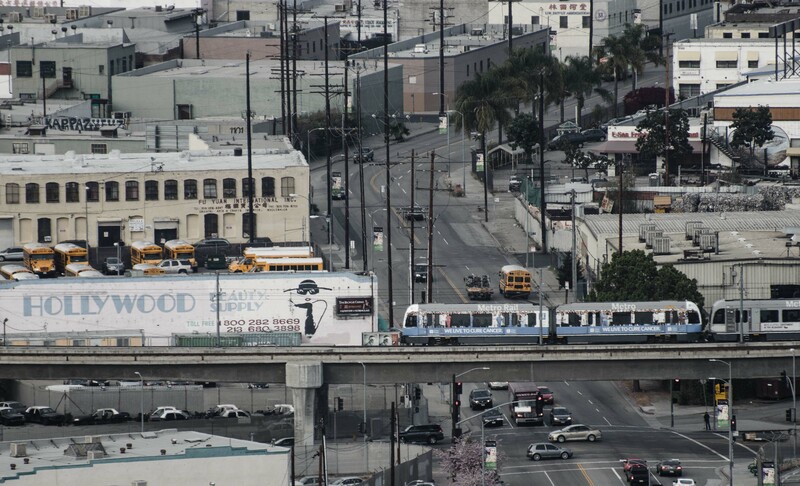 ART OF TRANSIT: A Gold Line train passes over Alameda Street in downtown L.A. on Friday. The photo was taken from the City Hall observatory deck. Photo by Steve Hymon/Metro. Here is an article intended to provoke. Drawing on a variety of stats, Los Angeles-based writer Joel Kotkin argues that the fastest growing cities in the U.S. in recent years are also the kind of car-centric, sprawling suburban-dominated places that are often ridiculed in urban planning circles. Among those: Raleigh, Austin, Houston, San Antonio, Las Vegas, Orlando, Dallas-Fort Worth, Charlotte and Phoenix. One common article of faith among mainstream urbanists, at least when they stop to note this growth at all, is that these cities grow mainly because they are cheap and can house the unskilled. But in reality many of these metropolitan areas are also leading the nation in growing their number of well-educated arrivals. Houston, Charlotte, Raleigh, Las Vegas, Nashville, and San Antonio, for example, experienced increases in the number of college-educated residents of nearly 40 percent or more over the decade, roughly twice the level of growth as in “brain centers” such as Boston, San Francisco, San Jose (Silicon Valley), or Chicago. Atlanta, Houston, and Dallas each have added about 300,000 college grads in the past decade, more than greater Boston’s pickup of 240,000 or San Francisco’s 211,000. Kotkin frequently writes about density and urban planning. He has certainly needled attempts to make L.A. more dense and transit friendly, authoring a 2007 op-ed in the L.A. Times alleging that Los Angeles is turning into Manhattan. That’s of course a ludicrous thing to say — and usually only said by people who have either never been to New York or Los Angeles or believe that their readers can’t tell a tall building from a short one (L.A.’s most dense sections are less than half as dense as Manhattan’s densest sections). That said, I think this new article is super, uber-interesting. Kotkin is on to something: The car-centric cities of the middle of America are still very popular. And they’re changing, with old neighborhoods being revived and, in some cases, downtowns being rediscovered and new park systems being built. And, of course, many are investing heavily in transit and light rail (an effort dismissed by Kotkin as “quixotic”), a list that inclues Phoenix, Houston, Charlotte, Dallas and Orlando. What does all this have to do with Los Angeles? That’s a great question. L.A. in some ways competes with other cities and states for jobs, economic opportunities, businesses, new residents, scholars, etc. So that’s important for our local leaders and residents to keep in mind — no one wants to be Detroit, although I don’t think L.A. is remotely close to that. More importantly, perhaps, I think it points to a broader trend: America is becoming an urban nation and even some of the most dreadful cities are coming back. If the majority of Americans are going to live in cities, then perhaps it’s time for Congress to recognize that fact and start investing in those places. Azusa will be home to two Gold Line Foothill Extension stations — one in downtown Azusa and the other just north of Citrus College. The grant from Metro will help the city plan transit-oriented developments and re-work its zoning code to permit more density near the stations. There is certainly room in downtown Azusa and I think the first, easy move that Azusa officials can make is an easy one: call officials from nearby Claremont, who have done a splendiferous job revitalizing their downtown. Gov. Jerry Brown is visiting China and will be checking out China’s vast and relatively new (and highly government subsidized) high-speed rail system. With California’s bullet train still many billions of dollars shy of the funding it needs to complete a San Francisco-to-Los Angeles leg, Gov. Brown will also be inquiring about Chinese interest in investing in the California project. Although I’ve been to both NYC and many of the cities listed in that article, I can say that LA is a dense city because we have no more open land left to develop. If you go to all the booming cities listed there, there’s still lots of open land for development. LA however, pretty much used up all the open land that was available and this extends out all the way to our neighboring counties. Hardly any open land exist between our freeway exits. Compare these cities where it freeway exit-lot of more open land for development-freeway exit. A dense city doesn’t mean tall skyscrapers everywhere like Manhattan. A dense city in LA terms means how little land space is left for development. Moving forward, the question is how LA can compete with the growth of these cities when we have no more land left to develop new jobs and residences. How does LA compete with a city like Dallas where an acre of land is dirt cheap for real estate developers to build a new business parks or a gated community, when LA doesn’t even have such lands left? Dense means ‘people living per unit area [square mile/km]’. It’s sort of a silly metric. Although it makes transportation costs easier to manage it does not necessarily equal greater standard of living. Claremont’s Village was expanded, not revitalized. According to US Census, the Los Angeles-Long Beach metropolitan area is the most densely populated area in the nation. And as USC Fan said, we do not have much land left to develop; we’ve over-developed everything all the way to our neighboring counties. Moving forward, our only option is to start demolishing old buildings, reclaim parking lots, and start building taller and taller residences and office buildings. Be prepared for a more denser living LA whether you like it or not. The Daily Beast is still sunbelting? Did anyone tell them that the Great Recession happened? DC is the fastest-growing major city; places Las Vegas and Phoenix are shrinking. Phoenix and Las Vegas both gained population between the 2000 census and now. I don’t believe the rate of growth is as dramatic as it was in the 1980s and 1990s but both cities are still adding residents. Correct, LA area is the MOST dense in the nation. It would be accurate to say that Manhattan, just one of the NYC’s five Burroughs, is a very tiny place that is extremely dense, and with all its problems. Let’s remember the legions who board those LIRR, MNRR, and NJTransit trains OUT of Manhattan each work day. They don’t find Manhattan alluring to them at all, except to get a good paycheck for much a preferred lifestyle somewhere else with more beauty in the Tri-State area. The often cry of “Manhattanization” here in LA is attempt to prevent us creating such dense areas in very tiny areas that all of the LA advantages are lost. We aren’t interested in being that dense with its concomitant problems. We have traditionally NOT wanted really tall buildings, except downtown as the only appropriate place for them, in our neighborhoods and don’t like how the sun is blocked if too many of them go up so close to the RESIDENTIAL neighborhoods they want to build them like Hollywood, etc. We don’t want more buildings on the scale of downtown LA in any more of our neigbohoods, and would we not really want to UNdo Century City with all the horrid traffic it has created? People here really don’t see a tall building they like, except downtown and aren’t enamored with them. And BTW, most people consider a place to avoid (along with parts of the west side) PRECISELY because of its density. Sorry Steve, et al. and all the transplants, but you need to go back from where you came because we are not interested in “becoming” Manhattan. In fact our LOW density is what made LA a very desirable place to live and was a draw to millions, including transplanted Manhattanites. The further irony is that our density is not seen nor appreciated as a plus by most people in the US, but a huge negative. In fact, it is the #1 complaint of people who live here. The freeways are already full enough, thank you, and at #1 most dense area, we certainly don’t need to add more by lifting restrictions and building 65 story towers throughout LA. Thank you. Over a very wide area, the L.A. area is dense. That still doesn’t make it anywhere near as dense as New York as a whole or Manhattan in particular. The cry of Manhattanization, I think, is insulting to anyone who has been to both Los Angeles and New York and can see how utterly different the places are — and how far apart they will remain as long as Manhattan continues to be an island and Los Angeles continues to be connected to the mainland. Los Angeles was hardly a speck on a map at the end of the Civil War. Most people here are presumably transplants, although it’s a matter of degree. I think there is a wide variety of opinions among the populace here about density and where and how we should put it. I personally do not want Los Angeles to become New York, although I do think there are areas that could be denser and that density will bring certain benefits such as better transit, ability to bike and walk and more of a critical mass that attracts businesses. I also think that many people realize that low density when combined with sprawl and putting all our mobility eggs in one basket for decades (i.e. freeways and roads) has led to a lot of traffic. If you like sprawl and low density but gripe about the status quo, then what do you like? Joel Kotkin is a conservative on economic and other issues. Of course, he is trumpeting those conservative examples he cites. He has never been balanced in any of his TV reports (we do remember him from his days at FOX 11 with Rupert Murdoch’s imprimatur still wet upon his brow) or writings. Totally predictable and know new ideas, as usual. It would have been nice if Joel didn’t have a conclusion to then set about to support, but this is his way. It would have been nice to have someone to have been balanced in their approach to this subject. While I agree with you in principle, but reality wise I think LA has no other choice but to start developing more high rises and make better use of our existing land to be competitive with other cities. Yes, LA County is a lot bigger than the small area than Manhattan and the five boroughs; yet the fact is that we’re still #1 in the nation when it comes to population density despite a large area shows us that we have a problem. We can’t keep sprawling; we’ve sprawled ourselves to the limit. There’s no more land to develop and yet, the population of LA keeps increasing. Our city is getting denser everyday. If the trend continues, sooner or later we’ll be faced with 10,000 people per square mile and trying to fit all of that within LA County. The realistic way moving forward to cope with ever increasing population numbers in limited land space is to ease height limitations, zoning laws, reclaim parking lots and start investing in mass transit. So then, what is the best solution to help the housing and business situation in LA? Poor City Planning hit on the nail that the problem is that the population in LA is increasing. How do you build more residences and business when there’s no more land left to develop? We can’t keep telling people to find cheaper homes in Riverside or Ventura and make then commute here when gas prices are this high. What do you want to do, make our freeways more congested and make people commute 50-100 miles everyday and make them consume more gas reflecting gas prices even higher? We need solutions. “I don’t want high rises because I don’t like it” is not an answer to this problem. In my opinion, LA isn’t like Manhattan which is a dense place in a small area. Rather, I think LA is becoming more like Tokyo and Seoul: a dense city over an over-developed wide area with no more room left to expand. You can see this with Google maps on how big our metropolis is and how very little land is left within our county. I think there are plenty of places in Los Angeles and L.A. County where the density could be bumped up in order to build more housing and create nicer communities. Many of our big commercial corridors could easily absorb some two, three or four story residential buildings – and many of those corridors are big transit routes, too. Also, downtown Los Angeles has plenty of room to grow. I think the problem is that politicians, real estate developers, and the home owners simply do not care or they are completely out of touch with reality. Existing home owners do not want to sell their homes because they know that LA is land scarce and they will put out as much as possible to raise their value of their homes. Real estate developers want to make as money as possible so they make rent and condo prices so out of reach that it is unaffordable for most middle income families. Rent prices in LA are totally out of control too. People are making less money and they keep raising rent. Who seriously can afford all those outrageous prices? They say it’s all market price, but all these expensive condos are sitting empty. Doesn’t that ring a bell that something is wrong with pricing for market demand? Hello, Econ 101? Supply versus demand? Sheesh. And the politicians. They simply don’t care. All they care is about is being elected so they stand with these home owners and real estate developers who say “it’s market value” or “won’t someone think of the traffic” and boo-hoo crybaby stories about the sun being blocked or how they don’t want more people into their neighborhood. Everyone needs to face the facts. LA has a problem and it’s only going to get worse. People need to wake up and start electing people who have the guts and back bone to say enough is enough, kick these selfish homeowners out and put caps onto rent and housing prices.